Sara Mecum of the Cadets' front ensemble sent in this one. "When a mother hears her child come home from a drum corps show plotting to steer their life in a direction that leads them very far from home and involves a great commitment of time and money, not to mention living on a bus with a bunch of older strangers, I'm sure they become very nervous. But look how many of them let us do it anyway! So there must be something that eases their minds and softens their hearts into accepting this idea of "marching in a drum corps" that so many of them are unfamiliar to. "My mom was very brave to drive up to New Jersey from North Carolina to volunteer at our April camp. After meeting many other corps moms and all the excited volunteers, she was much more comfortable with sending me away all summer to participate in this activity. 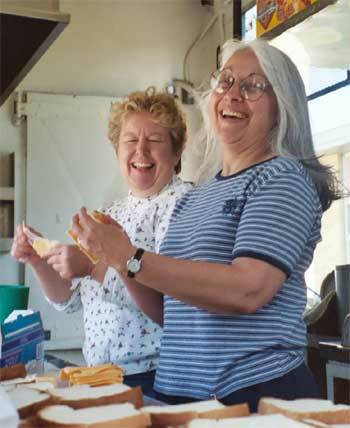 "Shorty's mom and my mom are on the food truck here, making grilled cheese sandwiches for our supper Saturday night. Our moms had to sleep on the cold hard floor just like us -- and I know older backs don't take that sort of thing as well as the younger ones do! So thank you mom, not only for helping at this camp and for coming with me on every middle and high school band trip, but always for encouraging me to stick with my highest ambitions and for letting me live out my dream of wearing the maroon and gold. "Going to a camp and observing things on your own is probably the best way to understand why your child wants to do this activity so badly, but especially in the first year, the key to not worrying about them every minute of the summer is trust. And it means a lot to me knowing that my mom trusts me this much! Thanks for everything mom!" Thanks Sara!